ObjCPropertyImplDecl - Represents implementation declaration of a property in a class or category implementation block. Definition at line 2758 of file DeclObjC.h. Definition at line 2760 of file DeclObjC.h. Definition at line 2864 of file DeclObjC.h. Definition at line 2865 of file DeclObjC.h. Definition at line 2246 of file DeclObjC.cpp. Definition at line 2258 of file DeclObjC.cpp. Definition at line 2814 of file DeclObjC.h. Referenced by mustSynthesizeSetterGetterMethod(), clang::ASTDeclWriter::VisitObjCPropertyImplDecl(), and clang::ASTNodeImporter::VisitObjCPropertyImplDecl(). Definition at line 2848 of file DeclObjC.h. 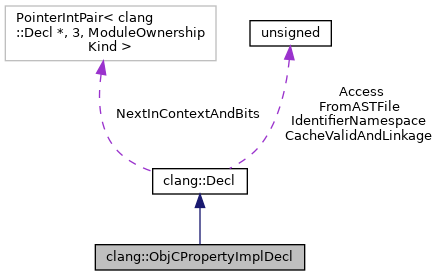 Referenced by clang::CodeGen::CodeGenFunction::GenerateObjCAtomicGetterCopyHelperFunction(), clang::CodeGen::CodeGenFunction::generateObjCGetterBody(), hasTrivialGetExpr(), and clang::ASTDeclWriter::VisitObjCPropertyImplDecl(). Definition at line 2817 of file DeclObjC.h. Referenced by clang::CodeGen::CodeGenFunction::GenerateObjCAtomicGetterCopyHelperFunction(), clang::CodeGen::CodeGenFunction::GenerateObjCAtomicSetterCopyHelperFunction(), clang::CodeGen::CodeGenFunction::GenerateObjCGetter(), clang::CodeGen::CodeGenFunction::generateObjCGetterBody(), clang::CodeGen::CodeGenFunction::GenerateObjCSetter(), clang::CodeGen::CodeGenFunction::generateObjCSetterBody(), getMaxAtomicAccessSize(), isSynthesizedRetainableProperty(), mustSynthesizeSetterGetterMethod(), clang::ASTDeclWriter::VisitObjCPropertyImplDecl(), clang::TextNodeDumper::VisitObjCPropertyImplDecl(), and clang::ASTNodeImporter::VisitObjCPropertyImplDecl(). Definition at line 2822 of file DeclObjC.h. Referenced by isSynthesizedRetainableProperty(), mustSynthesizeSetterGetterMethod(), clang::TextNodeDumper::VisitObjCPropertyImplDecl(), and clang::ASTNodeImporter::VisitObjCPropertyImplDecl(). Definition at line 2826 of file DeclObjC.h. Referenced by clang::CodeGen::CodeGenFunction::GenerateObjCAtomicSetterCopyHelperFunction(), clang::CodeGen::CodeGenFunction::generateObjCGetterBody(), clang::CodeGen::CodeGenFunction::generateObjCSetterBody(), getMaxAtomicAccessSize(), isSynthesizedRetainableProperty(), mustSynthesizeSetterGetterMethod(), Scan(), clang::ASTDeclWriter::VisitObjCPropertyImplDecl(), clang::TextNodeDumper::VisitObjCPropertyImplDecl(), and clang::ASTNodeImporter::VisitObjCPropertyImplDecl(). Definition at line 2829 of file DeclObjC.h. Referenced by clang::ASTDeclWriter::VisitObjCPropertyImplDecl(), and clang::ASTNodeImporter::VisitObjCPropertyImplDecl(). Definition at line 2856 of file DeclObjC.h. Referenced by clang::CodeGen::CodeGenFunction::GenerateObjCAtomicSetterCopyHelperFunction(), clang::CodeGen::CodeGenFunction::generateObjCSetterBody(), hasTrivialSetExpr(), and clang::ASTDeclWriter::VisitObjCPropertyImplDecl(). Definition at line 2265 of file DeclObjC.cpp. For @synthesize, returns true if an ivar name was explicitly specified. Definition at line 2844 of file DeclObjC.h. Definition at line 2815 of file DeclObjC.h. Definition at line 2852 of file DeclObjC.h. Definition at line 2820 of file DeclObjC.h. Definition at line 2831 of file DeclObjC.h. Definition at line 2860 of file DeclObjC.h. Definition at line 2801 of file DeclObjC.h.